Beware of what you buy on the Net!!! Yesterday we FINALLY got back from Easley. A day later than I’d planned, but that is another story (for me, it felt like that movie “Trapped in Paradise.”) I was FINALLY able to open one of my Christmas presents that I purposefully waited to open … A Sony Blu-Ray player with internet streaming. I was so excited!! I opened it, wired it up, and began the setup. And something wasn’t right. The model of blu-ray player we bought had built in WiFi so I wouldn’t have to run a CAT5 line from my router to it. This one didn’t seem to have that feature. As I browsed through the setup, it finally occurred to me to check the model number on the front of the unit. And that explained the entire thing: The blu-ray player, which was in what seemed to be an unopened box with the right model number and right documentation was the WRONG PLAYER. As a matter of fact, it was about $50 less of a model than the one for which we paid!!! Diana contacted Amazon. She thought she’d bought it directly from them, but instead it was from someone who sells through them. They sent us a prepaid return shipping label and assurances that they would credit our account once they receive the box. And THEY would straighten this out with the vendor. It made me wonder how many people might’ve bought this equipment, and if not looking for the very feature I needed, would’ve installed it and been none the wiser. I know had my parents bought it that’s exactly what would’ve happened. So, the moral of the story is: CAVIAT EMPTOR!! (Isn’t that what Mike Brady used to say??) Let the buyer beware!! I’ve been hesitant to write this. But it is really churning around in my heart and mind, so I guess I cannot escape it any more. I see something really dangerous on the horizon for the Body of Christ, and I know I will take heat for writing this. But I cannot run from it anymore. Reshaping. Remolding. Allowing our hearts and minds to evolve (or devolve) into a place that is comfortable for us, yet dangerous for the Kingdom of God. And I see it running rampant right now in America. When we reshape God into something that fits our lives comfortably, we are headed down a DEVASTATING ROAD. Yet it happens every day and Christians, people who are supposed to know better, are flocking to it. Because it is easier to reshape and fall into the massive vision of a God who is 50% less filling than it is to walk the narrow path. Jesus warned us that the wide path would be the easier path to walk, and many would head down that path. And it would lead to destruction. He also told us that the path to Him would be narrow and difficult, but it would lead to eternal life. And now I see churches and even people I love and respect headed down that wide, easy path. And when I dare to say anything I am labeled as “crazy,” or “jealous,” or a variety of things I haven’t even heard. I agree that feels very NATURAL for us to seek comfort in our relationship with God, so it doesn’t surprise me that so many are doing this. And, even though I have a Master of Divinity and an earned doctorate, I don’t consider myself a renowned theologian … but even I can see from God’s word that a relationship with Him WILL CHALLENGE US, and it WILL CONFRONT US about our sin AND about our OBEDIENCE, and it WILL BE UNCOMFORTABLE at times. The very nature of the Gospel is confrontational and compels me to strive towards living a Romans 12 life. And that is neither easy nor comfortable. I am hoping and praying today that we will all wake up. Will you join me?? The Gospel according to … YOU?? Last night in worship, we looked at the Prologue to the Gospel of John and the first few verses of I John. Both passages are very similar, and in them John makes a couple of strong points: He was only sharing what he KNEW TO BE TRUE. From FIRSTHAND EXPERIENCE. And, he shared that Jesus Christ IS THE SON OF GOD. IS ETERNAL. IS THE AGENT OF CREATION. (The list goes on and on). But, what we explored last night was the idea that John knew the obligation he had to share what he knew. Have we shared what we know to be true about Christ with the world?? Even with our families? What if all the books were destroyed and all that was left to lead our families to His throne was what we wrote because we know it to be true? In other words, if you wrote all that you KNOW to be true about God down in a book, how would it read? It’s a compelling thought. What do I KNOW to be true about Christ? Do I share it with those I love? This Christmas season, you can give those you love the greatest gift of all … tell them what you KNOW to be true about God!!! God works it all out His way! Last night in Bible Study we were talking about how God worked everything in the Christmas story out. In an amazing way!! Read the first couple of chapters of Matthew and see how it all worked out … faith, fact, common sense … God worked it all out in HIS way!! It reminded me of a time in my life when God worked some things out like that. Miraculously. Not long after I accepted Christ (at the age of 23) God started calling me to ministry. And I ran … I ran so far away. I told myself it was natural to desire such a thing since I was so on fire and in love with God!!! (Looking back now, that was the LAMEST excuse I used). Krissy was born in November of 1990, and then I KNEW God wouldn’t want me to leave a good job (in which Diana didn’t have to work but could stay home with our baby) and go back to school. It just seemed to be too much. I ran … I ran so far away. When God finally started really pinning me into a corner, I did something I should’ve been doing all along. I had kept all of this to myself for a while. Frankly, I dreaded telling my wife and new mother to my child that God was calling me to ministry and I would probably have to leave my job … When I finally told her, I discovered how God really does work in the details. YEARS ahead of me. When I expected the woman I love to look at me and tell me I was crazy, she did quite the opposite. She told me something that absolutely blew my mind. At this point in our lives, Diana and I had been either dating, engaged, or married for almost 7 years. We knew each other pretty well. And I’d known her since she was 17. She told me something she’d never told me: That 9 years earlier, when she was 15, she’d been at a youth retreat and God clearly told her something. Now, if you know Diana like I do, this was going to be significant. She is not the type to throw around the “God told me” stuff. At that retreat, God told her she would marry a pastor. She also shared that when she knew I was the one, and she KNEW I wasn’t going to be that pastor, she just figured maybe she’d misunderstood God. 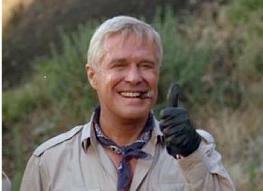 I write today to say this: God makes Hannibal Smith look like an amateur. (Maybe it will take an A-Team fan to get that).